Committed to driving transformation in the South African wine industry, the Cape Winemakers Guild (CWG) in association with VinPro has expanded its highly successful Oenology Protégé Programme with the launch of a similar internship scheme to develop young viticulturists. The new CWG VinPro Viticulture Protégé Programme, an initiative of the Nedbank Cape Winemakers Guild Development Trust, gives promising individuals the opportunity to realise their dreams of becoming fully fledged viticulturists after a two-year internship. “The Protégé Programme is a major priority for all of our members. Thanks to a generous contribution from the VinPro Foundation, we are now able to branch out into niche areas of the wine industry which will broaden the reach of our transformation efforts significantly,” says Louis Strydom, Chairman of the Nedbank Cape Winemakers Guild Development Trust. “We will start by taking in one Viticulture Protégé in 2015 and hope to see it grow and be just as successful as the existing Oenology Protégé Programme,” says Strydom. Since its inception in 2006, the CWG Oenology Protégé Programme has seen the appointment of five graduates in full time winemaking positions. “Although it is great to invest in initiatives that show positive short term results, we prefer to take a longer term view of the industry and focus our involvement on projects that will make a critical contribution towards the sustainability of the industry and its people over the years to come,” says VinPro Transformation and Development Manager Johan Giliomee, an advisory service that renders professional and need-driven consultation services in viticulture, oenology, soil science, agro-economy and general management to wine producers. one such organisation that can make a difference,” adds Giliomee. Established in 2013, the VinPro Foundation serves as a vehicle for funding key initiatives that can make a difference to the wellbeing of all participants in the South African wine industry. The CWG VinPro Viticulture Protégé Programme aims to cultivate, nurture and empower promising individuals to become viticulturists of excellence. Mentored by members of the Cape Winemakers Guild, interns receive hands-on training with regards to the intricacies of cultivation practices to ensure top quality grapes for the production of diverse wine types and styles. Successful candidates admitted to this cutting edge programme receive a salary, coaching and life skills mentorship, attendance of selected Cape Winemakers Guild functions and wine tastings, industry networking opportunities and a certificate of completion at the end of the two-year internship. and light hint of oak. Big, creamy mousse with bread and doughy flavours backed by fresh lemon and some pear. will develop in the bottle with interest. World Champion and Best in Class trophy results will be announced in September in World of Fine Wine magazine and FINE Champagne magazine. It’s a pity, for two reasons, that the CWG auction tasting for the handful of us who taste the wines blind, is held mid-August. It is, of course, in the thick of Platter tastings, so one forgoes most of a day of working on that; but since the event is held at Jordan restaurant, there is the delicious thought of George Jardine’s lunch afterwards, enough of a temptation to remain strong through this year’s 62-wine line up. The pity too as I and my colleagues also at the CWG tasting are exposed in our Platter tastings to a much wider range of wines, styles and, I have to say, quality, including some of the Cape’s best. The search continues……. long may it last!!!! Every problem has a solution, so it is said. But not every solution is successful in its own right. I stumbled on one this past week, when I asked Pieter Ferreira, at what age their vineyards had to be before the fruit would be channelled into the extensive range of Graham Beck bubblies. At the time our lucky group of media were faced with the vertical of Ferreira’s Blanc de Blancs (pictured below), and what I thought was the raison d’être of the event. 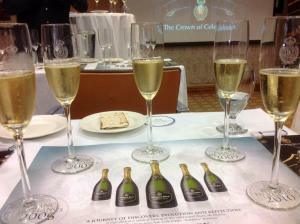 wine.co.za | news | Raising the bubbly bar. Raising a glass to champagne | Chemistry World.